Today’s class was about hojo 補助 (assistance, support) of the basics in every movement. This foundation is the key to get the natural flow in your taijutsu. I am always amazed by Senô sensei’s saino, 才能 (ability), nagare, 流れ (flow) and kôseido, 高精度 (precision). I remember asking him one day how he became so good at locks, footwork and at off balancing uke effortlessly. “When I began, I trained by myself a long time testing the efficiency of each degree of twisting applied to each joint of the body”. Once again, the best “ninja book” you can buy is an anatomy book. If you learn the bio mechanics of the body then you don’t need to use any strength. Remeber that self training is an important path of excellence and bujinkan students should do their homework more often. The fact that we get promoted fast in the bujinkan has created a negative side effect as westerners often think that “rank = proficiency”. But this is wrong. Our ranks rarely reward our technical skills. In fact we are given ranks to be worth them one day. Let me tell you a personal story. I was at sensei’s home one day and he complimented me on the evolution of my taijutsu (what can you say?) adding: “I will give you 14th dan”. I replied that I was not yet worth the 13th and that he could give it to me four month later when I be back. * “No”, he said “I will give it to you now. But you are right to think that you do not deserve it now but you are improving and soon you will be worth your 13th. This is why I give you the next one today”. uncomfortable, I insisted that he could get it at my next trip, to which he said -and this is the key of the ranking system in the bujinkan- “no, I want to give it to you now because if I die before you come back, you will have the rest of your life to be worth it!”. 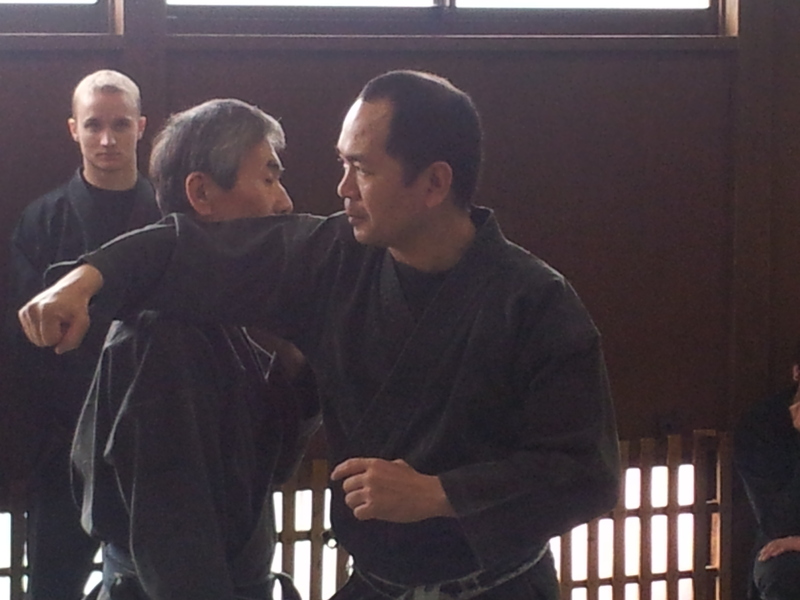 Ranks in the bujinkan are only a hojo 補助 (support) to help you in your training. They are an excuse to “keep going” and so that you develop the necessary skills. They are given “a priori” and not “a posteriori”. It is sad that so many people think they deserve the rank they have without actually training to develop the skills they are supposed to develop. Senô sensei and the other shihan have worked hard to get to the level they have today. Copying their movements (sensei’s and the shihan’s) is only good if you have the proper foundation in your taijutsu. But if you are lacking this foundation then you are just behaving like a monkey, mimicking without knowing. Hojo, 補助 (assistance, support) was the keyword of this class, and Senô sensei’s insisted a lot on it. Your taijutsu is “supported” by the skills you have developed when learning your basics and by reviewing them often. In France, in October, every year, I give a 5 day seminar covering the whole taijutsu of the tenchijin. Beginners and high ranks join in to review or learn the basics. It you are a piano player or a ballet dancer, you repeat your basics every day, so why should it be different in budô when bad basics mean death? Seitairikigaku, 生体力学 (biomechanics) is: the science (学) of giving life (生) and power (力) to the body (体). You need good basics so that you do not need strength. Senô sensei said that seitairikigaku is supported (hojo) by saino, 才能 (ability) to use “ashi sabaki”, 足捌き (footwork); “karada”, 体 (body), and kyori, 距離 (distance). This is why “chikara”, 力 (strength) is not needed. Hatsumi sensei keeps saying it in each class in Japan. We use strength because we are unable to read the balance of uke. I wrote about the importance of training with the various shihan here in Japan. If we compare this Senô’s sensei class with the classes of Nagato sensei, we can see the differences. Nagato sensei teaches something closer to “street fighting” and Senô sensei a bio mechanics study course. Both are important, and both will help you improve your survival skills. To the techniques we studied today, and echoeing with what Hatsumi sensei taught yesterday about small hidden weapons, we added a teppan (鉄板)** (or shaken) to the movements. What was really interesting was that the edge can be used as a pivoting point or a supporting point where it is in contact with uke. This chûshin action emphasizes the movements of the body and facilitates the off balancing of uke. A corner of the teppan can be used either to inflict pain to uke or as a pivoting point or increasing leverage, the body turning softly around the attacker to take his balance. This is done with no strength simply by applying your knowledge the bone structure of the body. Playing with the words we can say that: the kotsu, 糊 (sizing) is to know the kotsu, 骨 (bones) of the joints, in order to develop the kotsuzui, 骨髄 (true spirit) of taijutsu in a kotsu, 忽 (instantly). So I kotsu you, 乞 (invite) to find the kotsu, 骨 (secret) and develop the kotsu 骨 (know-how) to become kotsu, 兀 (dangerous). *note: like many I travel to Japan three times a year to train with my teacher. **note: a teppan is like a shaken but it is square with no hole in the middle, and the size of the palm of your hand. Bigger or smaller than the palm and the teppan will be not as efficient. Like any shaken it is not sharp. Usually it is not to be thrown at the opponent (you can) and it is used to hojo (support) your controls on uke’s body.